Playing pinball is fun and it’s something people of all ages can partake in and enjoy. For me, learning how the machines work and getting your hands on the parts that make the games tick take it to a whole new level. In fact I spend more time with my hands on parts than I do on the flipper buttons. When I was working on that first machine back in January and February, I often found the process very stop-start. In part, this was due to my inexperience with pinball machines and not really being able to plan what I was actually going to need (or being aware of what was available). I kept finding myself held up while trying to source random parts. Certain screw types, nuts, plates, frames, wires, housings, bulbs, etc. Some were easy to source while others more obscure and no real part number to reference. I experienced it again (although to a lesser degree) when working on my Fireball Classic. In most cases the part (or a suitable alternative) were sourced thanks to various sellers or through wanted posts on Aussie Arcade. I decided part way through the Fireball I was going to somehow source a pile of random spare parts from different machines which would help aid me with future repairs / rebuilds. Enter the “crap box” (or boxes now that I’ve picked up a few). I found these boxes irresistible. Like a big box filled with lucky dip prizes. Some will be cool. Others will be.. well.. crap. 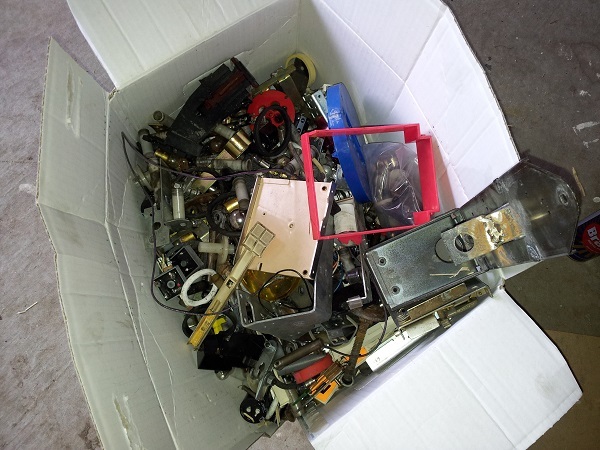 Who knows what I’ll score – it brings excitement 🙂 In this first example, I have a 15kg box of random parts that cost $6.60. Time for a smallish update on a few miscellaneous things that have had my attention during the week. The first thing I wanted to look at this week was the credit button on the front of the cabinet. It’s functioning correctly, but I was eager to disassemble it and give it a clean. 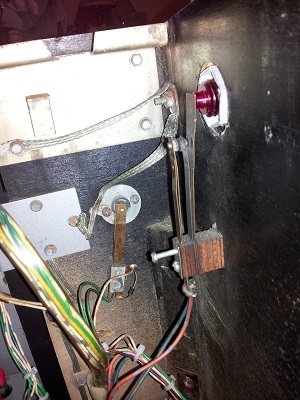 The coin door on my Pinbot machine is in need of some attention. It’s not the worst I’ve seen (actually, far from it), but it could certainly do with some love. The photo makes it look a bit better than it really is. Up close, there are far more chips and scratches along the edges of both the coin accept and coin return face plates. On the up side, the door itself is solid and should do up nicely. 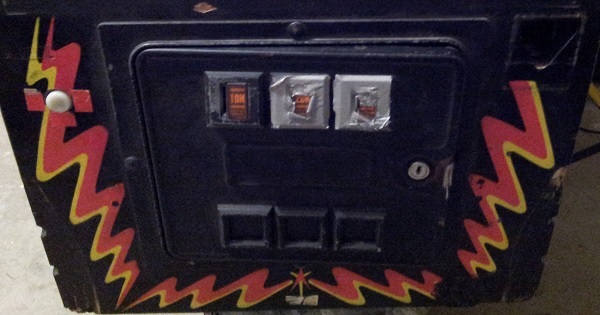 The middle and right coin accept slots have been covered up with tape (there are no coin mechs hooked up to either of these). My next update was going to cover the work I’ve done on the coin door. But something managed to squeeze in just before it. I should have the coin door all ready by Sunday though, so it’s not far off. 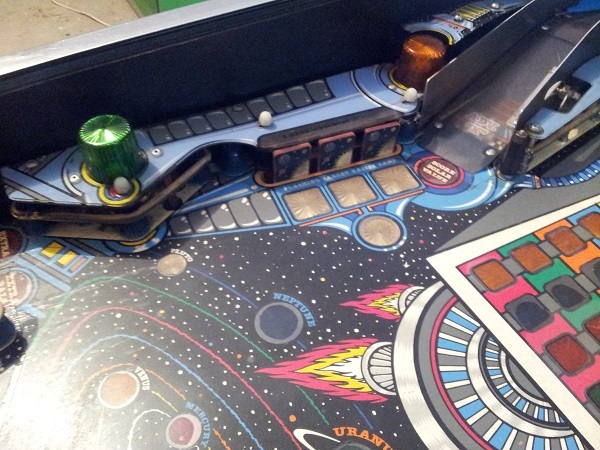 Meanwhile, the next area on the playfield to receive attention is the upper playfield – or more specifically, the vortex ramp. 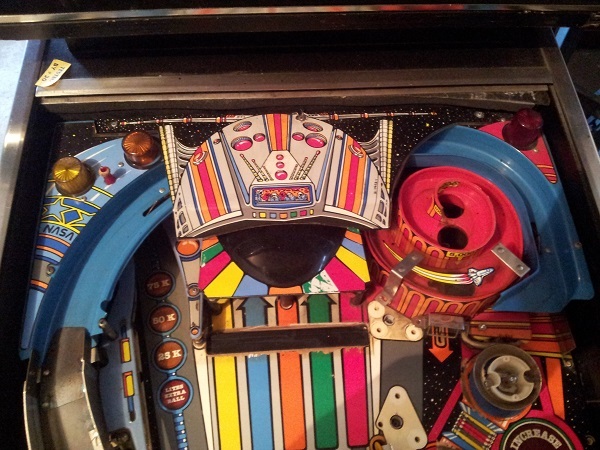 On the left hand side of the playfield is a bank or 3 drop targets. These drop targets are used to advance the planets during game play. A cool feature during game play is they reset if not hit within a certain time frame. It adds a nice element of urgency to hitting them. A few updates back I fixed a small issue with the bank where the game could not detect all 3 targets had been hit (there was an issue with one of the switches below the playfield). It’s now time to give them a service. The first think that stands out is the green lamp cover (which has been attached using pop rivets) should be orange. Should be easy enough to replace though.